Based in Wigan Lancashire, we have been supplying awnings, canopies and carports throughout the North West for many years. With our premium range of awnings, made in the UK from the finest materials, as well as a budget-friendly line of DIY awnings. we've got an awning to suit everyone, whether you're looking for a commercial awning for your shop or a sun canopy to provide shade in the summer. We are dedicated to bringing you the highest quality awnings at the lowest possible prices. We have both manual awnings and electrically operated awnings with a large choice of both sizes and fabrics to suit your needs. We can even supply made-to-measure awnings with logos printed on the fabric - a superb choice for any retail outlet, bar or restaurant. If you're looking for an awning of premium quality, then you'll adore our exquisite bespoke awning collection at our sister website Sovereign Awnings. Made in the UK, our premium awnings are made from the finest, durable materials in a variety of sizes, styles and fabric colours. We can even offer signwriting services to reinforce your branding if using your awning for commercial purposes. Chosen by homeowners and businesses alike, the Sovereign Awning range is suitable for commercial and residential properties with each awning provided with a 5 year guarantee. 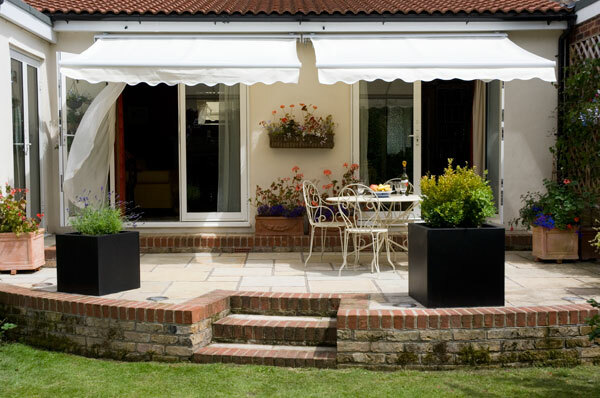 Our team of trained fitters can install the awning at your property for the perfect fit. If you haven't anywhere to attach an awning, our skilled team can often construct a solution. Call today on 01942 234932 for a free quote. For customers looking for a quality awning that won't break the bank, then our range of manual and electric DIY awnings are just for you. 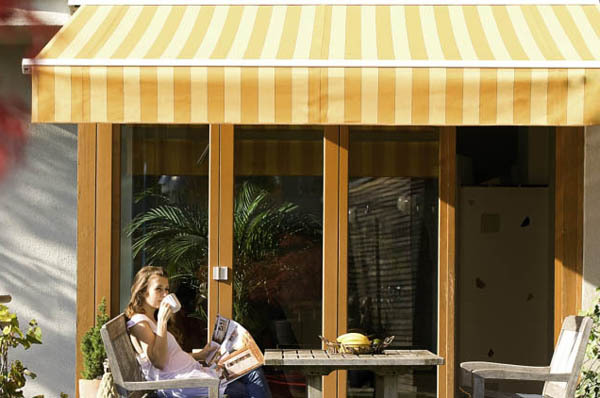 Available in non-cassette, half-cassette and full cassette, the DIY awnings can be operated manually, with a remote control or even fitted with a weather sensor. Our 300gsm polyester waterproof awnings start from £220 and are delivered to the UK absolutely FREE. View our full price list to quickly find an awning to suit your budget..
All of our awnings are measured width x projection in metres. Choose from a wide selection of colours. The Awning Man and Sovereign Awnings (SMS Canopies and Blinds) are proud to be ranked number 1 awning supplier in the UK with Freeindex.